MSE Creative Consulting Blog: Today's Sunday Fun: "One of the Coolest Towns I've Been To"
Today's Sunday Fun: "One of the Coolest Towns I've Been To"
Wichita's "Keeper of the Plains", the symbol of our city. It’s not something I often write about, but for me, every city falls into one of two categories: a place to live or a place to visit. Very rarely does a city or town meet both criteria. Some places may be great to visit, even often, but it just doesn’t feel like home. Only a handful of places I’ve encountered have fallen into both categories. 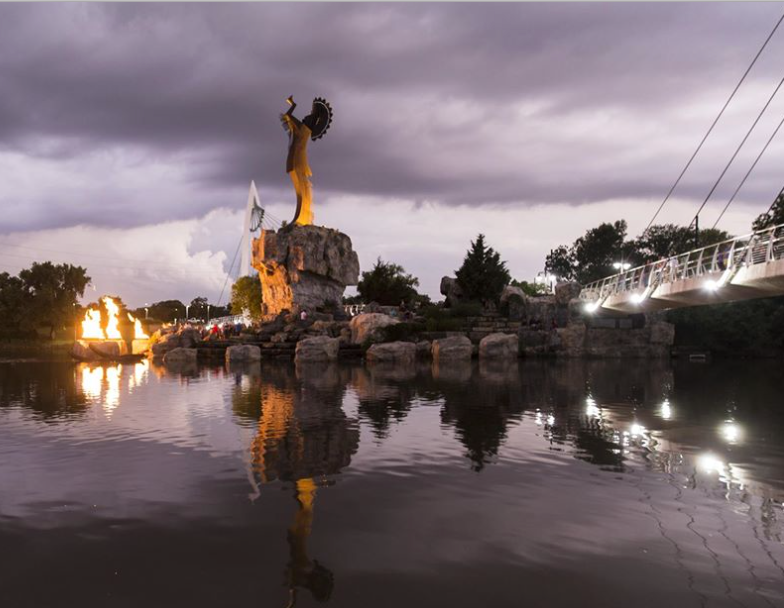 Wichita, Kansas feels like a place I could call home and it’s such a fun town that I’ll definitely go back. And, for the people that call this home – I apologize if you wanted to keep it under wraps – but, I can’t keep it to myself. Wichita, Kansas is one of the coolest towns I’ve been to. I had lunch two weeks ago with the President of a Wichita company who was a native of Houston. She has lived in Austin (college) then spent her adult life in Houston until moving to Wichita three years ago to take her present job. Her comment: "Wichita feels just like Austin twenty years ago." She further commented that she thought Wichita is about to "take off." Had lunch yesterday with a person born in the Wichita area who moved back recently after 17 years living in four cities. She commented how much Wichita changed and how she is especially impressed with Wichita State's Innovation Campus. So am I. If you are looking for a place to live, check us out. We are dead center in the United States and our terrific new airport makes it easy to get anywhere you want. I've lived in Wichita AND Austin. I love them both. Wichita could use some more decent and unique restaurants though and I hope our city doesn't end up with traffic like Austin, because I do not miss THAT detail of my second home city at ALL.